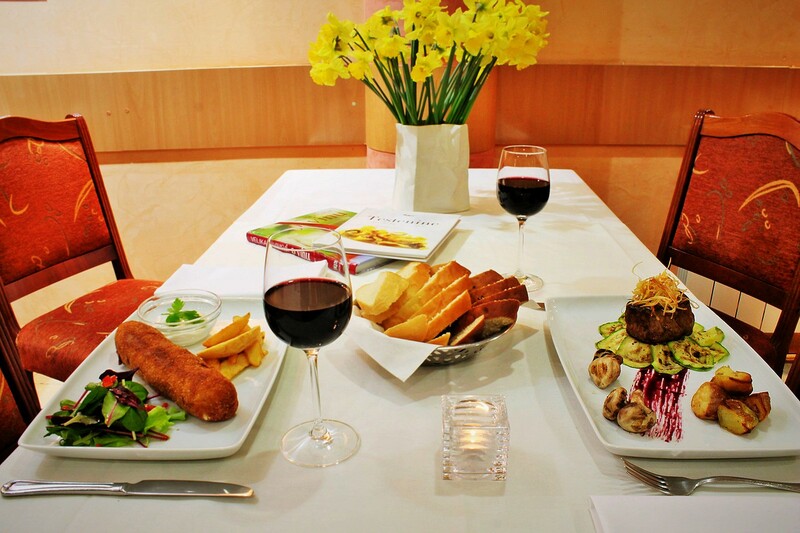 We aim to bring our guests the best of both culinary worlds. First and foremost, tasty, honest and enjoyable Serbian food, known for its fragrant vegetables, such as the peppers used to make “Ajvar” relish, beautiful when spread on the delicious local bread, or the omnipresent cabbage used as a base for salads and known as “Kupus” or, in its preserved, more rustic and stronger guise, “Kiseli Kupus”. Starters in the wintertime, but also at other times of year, normally consist of revitalising čorba or tasty soups, but just as prominent are the cold meats, particularly the smoked meats typical of the Balkan rustic tradition, most notably the delicious and very fine Njeguski Prsut of Montenegro. Cheese, meat and fish: the very best of Serbian and Belgrade food! The Serbian cheeses are certainly worth a look, particularly the soft, fresh cheeses such as the tasty Kajmak, often also used to accompany barbecued meat. Barbecue, or “Rostilj”, is an authentic Serbian and Balkan culinary institution and the method of choice for cooking succulent meat like beef, chicken and pork and, even more importantly, Plijescavica and Cevapi. Fish is also very popular, particularly freshwater fish, like carp and brown trout, that is often smoked first and then barbecued. Last but not least are the sweets, which have a strong Turkish influence, rich in honey, walnuts and hazelnuts, as well as fruit. Serbian winemakers have made gigantic strides in recent years and now produce top quality cabernet sauvignon, Merlot, Chardonnay and Riesling as well as wines produced from local grapes such as the Traminac, which gives white wines plenty of fragrance and body, the Tamjanika and the Prokupac black grape. You can't visit Belgrade and Serbia without having a little glass of Rakia, the region's most famous brandy.